At least 441 new species of animals and plants have been discovered over the past four years in the vast, underexplored rainforest of the Amazon. The discoveries from 2010 to 2013, include a flame-patterned lizard, a vegetarian piranha, a thumbnail-sized frog and a monkey that purrs like a cat. Discovered by a diverse number of dedicated scientists and compiled for the first time by WWF, the new species add up to at an astounding 258 plants, 84 fish, 58 amphibians, 22 reptiles, 18 birds and 1 mammal. This doesn’t even include the countless discoveries of insects and other invertebrates. “Compiling and updating data on new species discovered in the vast extension of the Amazon over 2010-2013 has shown us just how important the region is for humanity and how fundamentally important it is to research it, understand it and conserve it. The destruction of the ecosystems is threatening its biodiversity. We cannot allow these assets to be lost forever or fail to get to know them”, stated Claudio Maretti, WWF Living Amazon Initiative leader. 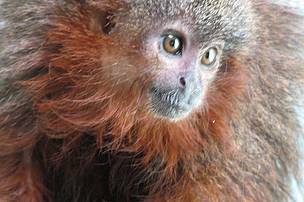 Named the Caqueta Titi Monkey or Callicebus caquetensis, this is one of about 20 species of titi monkey, which all live in the Amazon basin. And the babies have an endearing trait. “When they feel very content they purr towards each other,” explained scientist Thomas Defler. 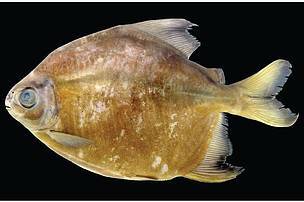 A new species of Serrasalmidae, Tometes camunani, is described from the upper drainages of the rio Trombetas basin, Pará State, Brazil. The Tometes genus of large-sized and strictly herbivorous serrasalmid fishes which reach approximately 500 mm length and a weight of up to 4 kg. Tometes exclusively inhabit rocky rapids associated with rupestral seedlings of Podostemaceae, their main source of food. Given their specific habitat, species of Tometes are especially vulnerable to the loss of ecosystems and are greatly threatened by the construction of hydroelectric dams in the Amazon Biome. 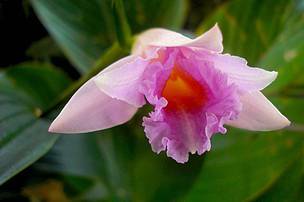 This impressive pink flower (Sobralia imavieirae) is one of 45 new species of orchid discovered. Already home to vast numbers of flowering plant species, this latest botanical bounty further heightens the Amazon’s global reputation for plant diversity. 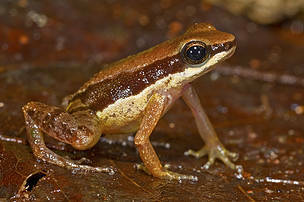 Despite only just being discovered, this thumbnail-sized frog is already thought to be highly endangered. In fact, its Latin name (Allobates amissibilis) means “that may be lost” because it thrives in an area that could soon be opened to tourism. 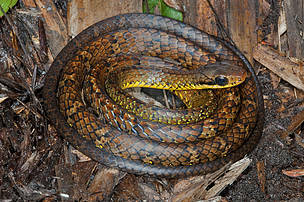 Found in the mountains of the Guyana-Brazil border, this brightly-coloured snake species was named Chironius challenger after Arthur C. Doyle's fictional character Professor George Edward Challenger in the novel The Lost World. 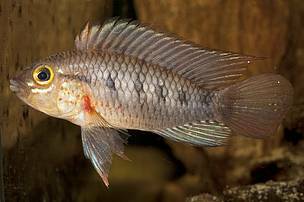 Scientists observed that this new fish species (Apistogramma cinilabra), is adapted to extremely low oxygen levels. Found nowhere else in the world, it is thought to be unique to one small lake in the Loreto region of Peru. All new to science, the recently discovered plants and animals have something else in common too. With very restricted ranges, many of the new discoveries are thought to be endemic to small parts of the Amazon rainforest – and found nowhere else in the world. This makes them even more vulnerable to the threat of deforestation that’s currently destroying three football pitches of rainforest every minute across the Amazon. Through our Living Amazon Initiative , WWF is working towards a comprehensive approach with governments, civil society, and the private sector to promote the transformational process needed to bring about an alternative scenario to better preserve the Amazon’s biodiversity. The Amazon rain forest. Loreto region, Peru. The term ‘new species’ is one used by the scientific community to indicate the first time a species has been officially discovered. ‘Describing’ a new species refers to the official process by which a species is described in the peer-reviewed scientific literature once discovered and therefore formally determined as ‘new’. This research presents a list of the new species from the Amazon Biome over the period 2010–2013. Only the new discoveries that have been described in peer-reviewed scientific journals have been included in this report. In addition to the species listed here, many other species, which may eventually turn out to be new to science, have been encountered and collected in the Amazon Biome over the past four years. Species currently awaiting official scientific recognition have not been included. This research has tried to be comprehensive in its listing of new plants and vertebrates described from the Amazon biome in the last four years. But for the largest group of life on Earth, invertebrates, such lists do not exist – so the total number of new species presented here is without doubt an underestimate. While we have tried to compile an extensive list of the new plants and vertebrates, this list should not be treated as an exhaustive record of the new species discoveries between 2010-2013. This research was supported by the UK’s entertainment and communications company, Sky as part of the Sky Rainforest Rescue Partnership between Sky and WWF. A WWF report launched in 2010 – Amazon Alive! 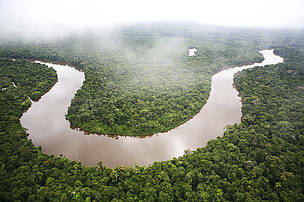 A decade of discovery 1999-2009 showed that between 1999 and 2009, at least 1,200 new species of plants and vertebrates had been discovered in the Amazon. The new species included 637 plants, 257 fish, 216 amphibians, 55 reptiles, 16 birds and 39 mammals. This new research shows that the pace of discoveries has not shown any indication of slowing.